As probably most of managers notice along their professional life, the main time-consuming issue comes from trying to organize processes effectively. Managers are constantly suffering from a lack of process visibility, which leads to poor management control. Employees get scattered tasks across different platforms, and it can be certainly not clear who is responsible for what at a certain stage of a project. If you want to avoid mentioned problems, enhance collaboration among employees and make your team accomplish more tasks in a less time, it is essential to consider workflow management software. 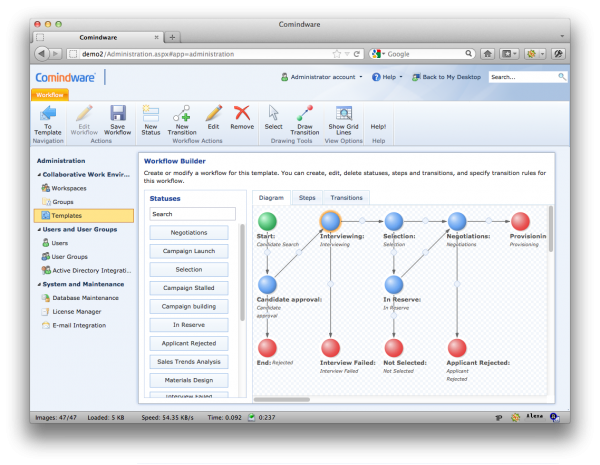 Comindware Tracker is work management software for Task Management, Workflow Coordination, and Issue Tracking. What makes Comindware stand out among similar wok management solutions is its unique advantage of flexible ElasticData technology that allows to modify workflow processes on the fly without interrupting work or losing any data. The software comes with already predesigned templates (ready to use for IT Help Desk, HR, Finance and Administration, etc. ), however it can be adapted to any specific area of business activities, thanks to this patent-pending technology. Managers get to organize their teams effectively. Workload distribution and its implementation take less time as tasks are allocated automatically through pre-designed workflows. Besides, workflows can be adjusted during the work process with no need to redeploy it. Employees get a clear understanding of what exactly to accomplish and when. That is reached thanks to the combination of Workflow engine with Task management tools. Each participant gets a personal list of assigned tasks, while teamwork is managed through integrated online communication features. Managers get a real-time control and visibility of the project. Comindware Tracker provides analytical capabilities in a form of dashboards and reports to see current status of the processes taking place at the company. It is becoming possible to work with workflows directly from MS Outlook. In order to save time and increase productivity, Comindware Tracker enables employees take advantage of their mailbox and turn Outlook tasks into a part of a workflow system. Choosing work management software might seem a hustle and definitely requires testing. Comindware offers a 30-day trial to help you make sure whether this product fits your company’s needs the best possible way. The product is available as on-premise software (supporting Windows), and as a Cloud subscription-based service as well. Each option provides the same usability and functionality.